In the previous article (http://ponnadi.blogspot.in/2013/06/anthimopaya-nishtai-4.html), we observed the divine mercy of emperumAnAr. We will continue with the many incidents from our pUrvAchAryas in this article. bhattar who was born as the son of kUrathAzhwAn and who was adopted by periya perumAL as his own dear son and raised by periya perumAL (and periya pirAttiyAr herself) was leading our sampradhAyam. Once, a travelling brAhmaNa visits srIrangam and goes to bhattar's assembly. He says "bhattar! 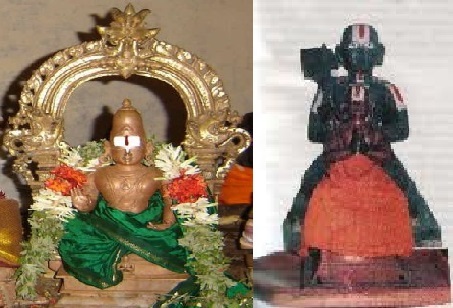 In western part (in/near mElkOte/thirunArAyaNapuram), there is a vidhwAn named vEdhAnthi. His knowledge and disciples are a good match for yours". bhattar, hearing the words of that brAhmaNa responds "Oh! Is there such vidhwAn?" and the brAhmaNa replies "Yes". He then leaves srIrangam and reaches vEdhAnthi's town and goes to the assembly of vEdhAnthi. He says "vEdhAnthi! In between the two rivers (srIrangam), there is a vidhwAn named bhattar who matches your knowledge and disciples". vEdhAnthi responds "Is bhattar a match for me?". The brAhmaNa replies "Yes. He is masterful in all scriptures starting from shabdha, tharkka, pUrva mImAmsa, uththara mImAmsa, etc". vEdhAnthi becomes worried and thinks "I thought there was no match for me since I have already won many scholars and am seating on 6 planks, each one representing one of shad dharshanam (the six philosophical schools - nyAya, vaisEshika, sAnkya, yOga, pUrva mImAmsa, uththara mImAmsa). But this brAmANa is saying that bhattar is even more well versed than me in all of these". The brAhmaNa returns to srIrangam and informs bhattar that he explained the greatness of bhattar to vEdhAnthi. bhattar asks the brAhmaNa "What did you say about my knowledge?" and the brAhmaNa replies "I told that bhattar is masterful in shabdham, tharkkam and all of vEdhAntham". bhattar responds "Oh brAhmaNa! you travel to many places and have become aware of various scholars and their knowledge. But even after knowing my full knowledge, you have only informed about my knowledge in vEdhAntham". The brAhmaNa asks "What else can I say to the vEdhAnthi other than your control over the most established sAsthram - vEdhAntham?" and bhattar says "You should tell him that I am an expert in thirunedunthANdagam (Translator's note: a divine work of thirumangai AzhwAr which beautifully explains the essence of vEdhAntham and all important aspects of our sampradhAyam)". Then bhattar starts contemplating on bringing vEdhAnthi into the srIvaishNava fold (Translator's note: As identified in 6000 padi guru paramparA prabhAvam, emperumAnAr himself desires to reform vEdhAnthi but due to his old age he is unable to travel and so instructs bhattar to do the same). He goes to periya perumAL and tells him "There is a great scholar named vEdhAnthi in the western part. I am requesting your permission to go and reform him. Please bless me that I am able to reform him and make him a leader in our rAmAnuja sidhAntham". perumAL acknowledges bhattar's request and considering his parental relationship with bhattar, perumAL instructs his own kainkaryaparas to accompany him through the journey. bhattar reaches the vicinity of the place where vEdhAnthi lives along with many srIvaishNavas. The kainkaryaparas who accompanied him were hailing bhattar's glories and were constantly saying "parAsara bhattar has arrived, vEdhAchArya bhattar has arrived, etc" and many musical instruments were played in front of him in pomp. He was wearing many divine ornaments and very beautiful clothes (all belonging to periya perumAL himself since he was the son of periya perumAL). At that time a couple of local brAhmaNas notice them and ask him "Who are you? Where are you coming from? You look dazzling and there is so much festivity here. Where are you going now?". bhattar responds "I am bhattar. I am going to debate with vEdhAnthi". The brAhmaNas say "If you go with so much zeal and excitement, you will be unable to meet vEdhAnthi. He will stay inside his palace and his sishyas will keep debating with you one by one for many months and will just procastinate and you will finally give up". bhattar then asks "What is the best way to meet him directly and engage him in a debate?" and the brAhmaNas says "Since vEdhAnthi is a wealthy person, he constantly feed the brAhmaNas in his palace. You dress like a poor brAhmaNa and enter along with them. So, you leave all your people/pomp behind and just go alone". bhattar gracefully agrees to their proposal, wears a kAshAya cloth on top of his clothes, picks up a kamaNdalam (small water pot) and goes along with the poor brAhmaNas to the maNdapam (hall) where the brAhmaNas are fed. In the hall, vEdhAnthi, seated on a raised platform, was happily watching the brAhmaNas arriving to accept the food. Of all, bhattar alone, goes straight to vEdhAnthi instead of going to accept the food. vEdhAnthi asks "Son! Why are you coming here?" and bhattar responds "I am here for a bikshai (alms)". vEdhAnthi says "Please go to where they are distributing food". bhattar says "I dont want food as bikshai". vEdhAnthi thinks, even though he looks poor, this man may be learned and so asks "What bikshA?". bhattar at once says "tharkka bikshA" (I want a debate). vEdhAnthi realises the words of the travelling brAhmaNa who mentioned about bhattar and thinks none other than bhattar would have the guts to come in front of him and ask for a debate. He thinks even though the looks are deceiving, it must be bhattar and asks "Who can ask for a debate with me? Are you bhattar?". bhattar responds "Yes, I am" and throws the kamaNdalam and the kAshAya cloth away. He starts furiously explaining the essence of sAsthram and vEdhAnthi immediately steps down from the seat and falls at the lotus feet of bhattar. He asks bhattar to accept him and purify him. bhattar, being very pleased that his objective was fulfilled quickly, acknowledges vEdhAnthi and performs pancha samskAram to him. bhattar tells him "Dear vEdhAnthi! You are already well aware of sAsthram. I am not going to explain everything in detail now. visishtAdhvaitham is the true principle. You give up mAyAvAdham completely, accept srIman nArAyaNan as the supreme and start being a leader in our rAmAnuja dharsanam". bhattar then decides to leave and all the kainkaryaparas (who were made to wait outside) arrive at that time with great pomp. bhattar was again decorated beautifully with divine clothes and ornaments and boards the palanquin. With many serving him with chAmaram, fan, etc., he starts leaving. vEdhAnthi observing the wealth, disciples and pomp, starts crying out loud saying "You are such a great personality. I am so fallen (more fallen than materialists since I was preaching mAyAvAdham). But you have crossed many forests, mountains, etc and mercifully arrived here and accepted me looking at my ill-fate. You are so merciful" and again falls at the lotus feet of bhattar. vEdhAnthi then says "You are none other than periya perumAL himself who has arrived here to manifest his beauty, tenderness, etc. For time immemorial, I have escaped the merciful hands of bhagavAn and considering there is no other way to help me, you have accepted a very poor brAhmaNa's form and accepted me who was filled with so much pride and ego. I cannot imagine and behold that form you accepted for me out of great mercy" and starts crying again. bhattar then lifts vEdhAnthi up and consoles him saying "You continue to live here happily" and leaves to srIrangam. After some time, vEdhAnthi, unable to bear the separation from his AchArya, decides to go to srIrangam. His wives stop him from going and he decides to divide his wealth and settle his wives before leaving. He divides his unlimited wealth in to 3 parts, gives one part each to both of his wives and carries the remaining part to offer to his AchAryan (bhattar) and leaves to srIrangam. He then reaches srIrangam, offers all the wealth to bhattar without any pride and leaves them at bhattar's disposal. He stands there with gratitude towards bhattar and bhattar being very pleased with vEdhAnthi's dedication declares "nam jIyar vandhAr" (நம் ஜீயர் வந்தார் - our jIyar has arrived) and embraces him. bhattar always keeps nanjIyar in his company and blesses him with all the essential teachings. jIyar fully accepts/worships bhattar and does not look for any other worshippable deity. From that time, bhattar called vEdhAnthi as nanjIyar, he became to be known as nanjIyar. Our jIyar (mAmunigaL) says that "nanjIyar lived for 100 years and lectured the meanings of thiruvAimozhi 100 times and performed sathAbishEkam (celebration commemorating the 100 times lecturing of thiruvAimozhi)". nanjIyar serves bhattar constantly and with his permission writes a vyAkyAnam (commentary) for thiruvAimozhi named 9000 padi. He asks his disciples if there is any one who can make a nice/clean copy of that commentary. The sishyas say "There is one varadharAjan who has been attending lectures here for a while. He writes very well". nanjIyar invites varadharAjar and asks him to show a sample of his hand-writing and he obliges. nanjIyar thinks "His hand-writing is beautiful. But since this is commentary for thiruvAimozhi, we should have this written by a very qualified srIvaishNava, not some one who just has pancha samskAram done and having the physical appearance of a srIvaishNava". varadharAjan understanding the divine thoughts of nanjIyar, at once submits in front of him and says "Please purify me to your satisfaction. I am at your service". Hearing this, nanjIyar becomes very pleased. He acknowledges varadharAjan and gives his full blessing. He explains the 9000 padi vyAkyAnam fully to varadharAjan and asks him to make a copy of the same. varadharAjan accepts that and says that he will go to his place, complete the task and return to nanjIyar. nanjIyar accepts the proposal. varadharAjan then, having to cross the cauvery river to go to his village, starts swimming across the river. He wraps the original grantham in a cloth and keeps it on his head while swimming. A big wave arises and suddenly carries the original grantham and goes along the river. varadharAjan becomes very anguished for the loss of the grantham and starts thinking what to do. He then, starts writing the original grantham which was blessed (taught) to him by nanjIyar. Since varadharAjan is an expert in thamizh, he also adds appropriate explanations in the commentary with in-depth meanings. He then goes to nanjIyar and submits the new copy at the lotus feet of nanjIyar. nanjIyar, observes that its the same as he first wrote and explained, but also, there were special meanings and elaborations at various places and becomes extremely pleased. He asks "This is very beautiful, but slightly different than what I explained to you. What happened?". varadharAjan stays silent out of fear and nanjIyar encourages him "Dont worry, just reveal the truth". varadharAjan then explains "Since there was good water flow in cauvery, I kept the original grantham on my head and started swimming. But when a big wave came, that took away the original grantham. I wrote this based on your mercy from my memory". nanjIyar hails varadharAjan's memory and intelligence and embraces him. He declares that varadharAjan is "nammudaiya piLLai thirukkalikanRidhAsar" (நம்முடைய பிள்ளை திருக்கலிகன்றிதாஸர் - Our dear piLLai thirukkalikanRi) and keeps him in his company always and explains all in-depth meanings to him. Our jIyar (mAmunigaL) says that "From the day, nanjIyar called varadharAjan "nampiLLai", he becomes to be known as nampiLLai". Our jIyar explains these incidents in upadhEsa rathina mAlai 50th pAsuram. anbudaiyOr sARRu thirunAmangaL thAn enRu nannenjE! அன்புடையோர் சாற்று திருநாமங்கள் தான் என்று நன்னெஞ்சே! namperumAL, nammAzhwAr, nanjIyar and nampiLLai were named with the "nam - our" prefix, due to the special glories they had. (Also explained as - namperumAL hailed satagOpan as nammAzhwAr. 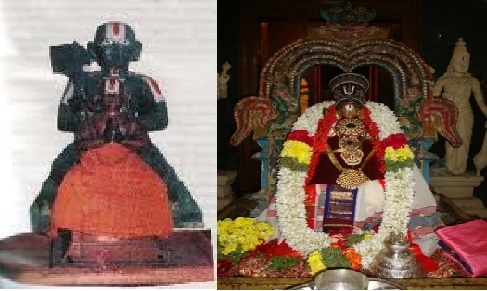 nanjIyar hailed varadharAjan as nampiLLai). They were given these dear names by the ones who are very dear to them. Oh dear mind! you also glorify those incidents by reciting these names now. nampiLLai's glories are such that "No one will learn the words of indhran, brahmA, rudhran, skandhan, etc any more in this world. Every one will be so wealthy if the just pick up a few words (which are like pearls) from the palace of nambhUr varadhar (nampiLLai)". Translator's note: This can be related easily with the charithram of naduvil thiruvIdhi piLLai bhattar's life where we has greatly honoured by the king with lots of wealth for explaining a rAmAyaNa slOkam based on nampiLLai's lectures. The whole incident can be viewed at http://guruparamparai.wordpress.com/2013/04/20/naduvil-thiruvidhi-pillai-bhattar/ . Translator's note: Thus we have seen the divine mercy of bhattar in purifying the heart of nanjIyar and in turn nanjIyar's total dependence and submission towards bhattar. We have also seen the interactions between nanjIyar and nampiLLai which demonstrates AchArya/sishya lakshaNam beautifully.